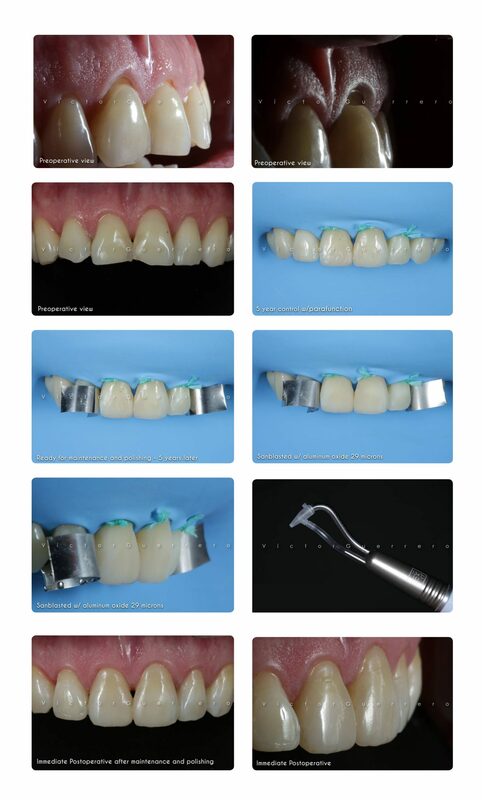 A great advantage of restorations with composite resins for anterior teeth with wear, is that you do not need to remove more healthy tissue and they are also easy to repair. The case shown in the photographic sequence, is with 5 years of follow-up, the approach was very conservative (direct restorations). The patient has as risk factors: parafunction, habit of biting objects and LCNC in the form of a wedge. To do the maintenance and polishing 5 years later, it was not necessary to wear more healthy tissue, the whole procedure was completely additive and without anesthesia. The post-hydration image remains pending!